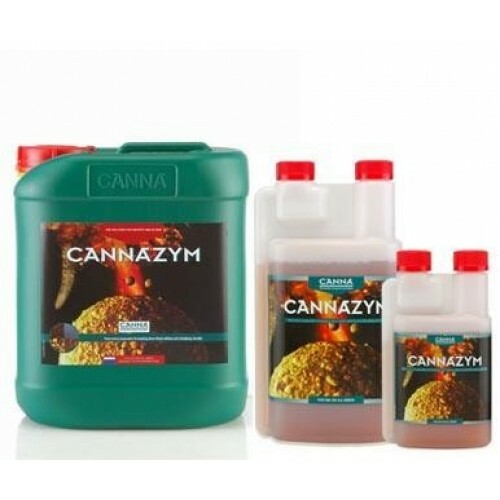 Canna Cannazym is combined of over 12 different enzymes designed to assist in breaking down dead plant remains to keep the dead roots from harming your blooming crop during its growth process. In addition to preventing harmful microorganisms from growing on your plants, it also provides superior nourishment to yield a healthy and abundant harvest. Cannazym also contains essential vitamins and nutrients that are easily absorbed to simulate the formation and growth of new root development and help your plants naturally fight off unhealthy pathogens. These vitamins also help boost hormone production. This outstanding product will turn dead roots into helpful sugars and minerals that are beneficial for plant growth. Canna Cannazym improves the uptake of nutrients as well as your plants overall defense system against attack from micro organisms and deadly diseases. It also helps prevent mold and bacteria from forming along the roots. Mold can severely stunt new growth and development. Cannazym also aids in preventing toxic substances from attacking your growing plants roots. Cannazym also works to improve the overall soil condition as it breaks down the root to create a healthy and balanced root environment. Its rapid breakdown transforms it into healthy nutrients and proteins further soil infections. This product can be used during the entire growth process and in any growth environment. Both seasoned, professional gardens and novice and private growers recommend this highly acclaimed product as it yields a crop that is both appealing to the eye and full of flavor. Do not use Cannazym with any product containing hydrogen peroxide as it will result in a harmful chemical reaction. Use within ten days and disregard any unused solution after ten days according to the directions on the product label. Mix 25 ml per 10 liter and apply weekly, at least once. Double the dose after the first two weeks. Read the directions for your special crop before use.